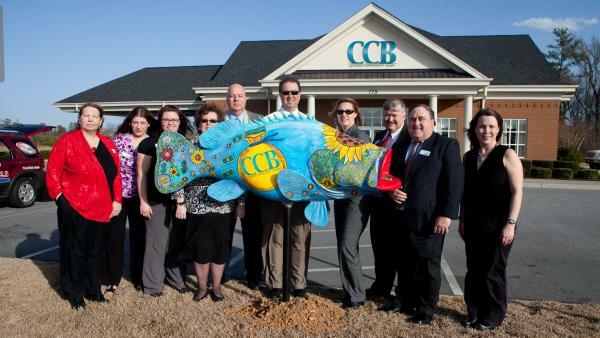 Citizens Community Bank (CCB) released their rockfish to the Roanoke Valley during the bank’s open house. Artist Sarah Deese-Davis grew up in Roanoke Rapids and is the daughter of artist Jane Deese. Sarah painted the fish in the bright blues of the CCB logo and decorated the fish with sunflowers, incorporating pennies for the seeds, other flowers and vines, and a large money bag with the CCB logo. The fish even has money in its mouth. She wanted something that would be fun and would draw visitors to the bank. CCB prides itself by being all about old-fashioned community banking. Its staff offers common sense solutions and approaches to serving their customers. CCB currently has branches in Roanoke Rapids, as well as South Hill, Boydton and Gasburg, Virginia as well as Oxford, NC. CCB is all about serving its customers, offering convenient drive-thru hours of 7 a.m. to 6 p.m. Monday-Thursday and Saturday hours from 9 a.m. to Noon.